Ground pork - about 1 lb. Mix the ground pork with the green onions, fish sauce, and garlic powder for maximum flavor. Heat a medium stock pot with the butter and olive oil. Add the onions and carrots. Cook until soft, about 5 minutes. Add the chicken broth. Adjust heat to high to bring it up to a boil. But meantime, start to make the meatballs - smaller than the ones I made! Drop into the hot broth. Simmer over medium heat about 20 minutes, until the meatballs are cooked. Add the pasta. Bring back up to a boil again. Add the kale, then cover, simmer. Check occasionally until the kale is tender. Hi! 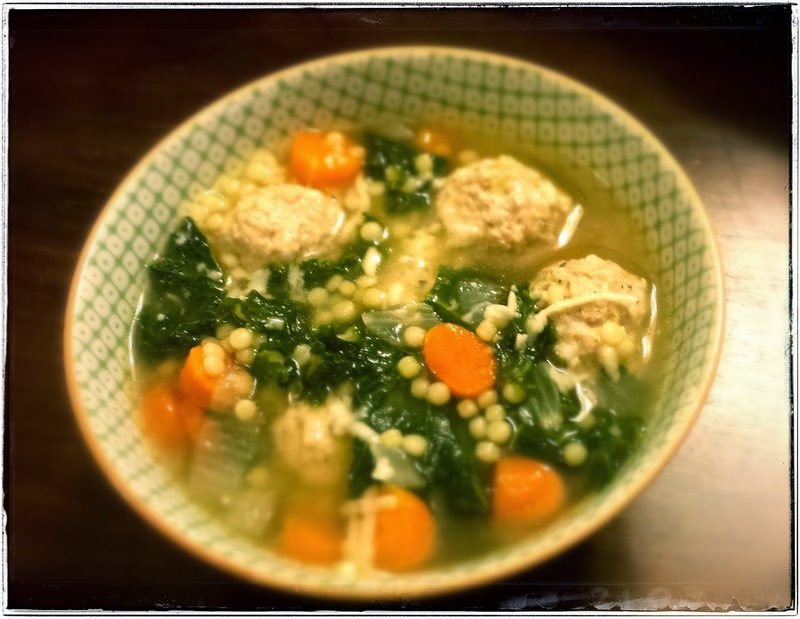 Your Italian wedding soup has been nominated as one of the "Best Italian Wedding Soup Recipes on the Net". To vote for it, please visit http://easyitalianrecipes.org/soup-recipes/best-italian-wedding-soup-recipes-on-the-net-vote-for-your-favorite/ (your recipe is positioned at #63).